German car manufacturer BMW has bought the Swiss Formula One team Sauber. 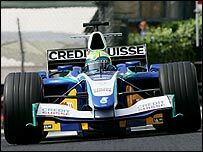 BMW said its decision to run its own team in the world championship for the first time from 2006 was its best chance of achieving success in F1. BMW said it would be happy to continue supplying engines to Williams, with whom it has a deal until 2009. "We want to discuss the future options with Williams in order to find the right way forward for both sides," said BMW board member Burkhard Goeschel. The relationship between Williams and BMW, which started promisingly in 2000, has deteriorated in recent months. "Regrettably, sadly, the relationship has been just too hostile for too long," said team boss Frank Williams on 10 June. "It makes life very difficult. It does not compare well with (previous) Renault or Honda relationships, which we regret." Williams director of engineering Patrick Head and BMW director of motor sport Mario Theissen criticised each other in the media before the Canadian Grand Prix. Williams said they had no comment on the Sauber deal. The name of the team, the driver line-up and identity of key personnel will be resolved by 1 January 2006, when BMW officially takes control. Theissen, who describes BMW's investment as "a co-operation", revealed the company had no intention of taking over Sauber before talks over an engine supply for next season began. He said: "It was a long-term process. Since last season we set down and considered what we could do. "Success can only be achieved with a fully-integrated team. 1995: Ford replace Mercedes as engine suppliers. "At the beginning of year we started talks with Sauber, at the time we were talking about engine supply next year. "We found common ground. We believe Sauber offers a good basis and foundation to further develop the engines. "We have decided to co-operate with Sauber as BMW. We are going to be in charge of the entire package. "It will be a fully-integrated team, a team distributed among two locations, BMW in Munich and we will not only preserve the Hinwil location but we will also expand it." Outgoing team boss Peter Sauber said: "I am going to give up operative management of this company. I will give advice to BMW and my team. "For Sauber, the partnership with BMW is an ideal solution as it supports the two goals which have always been paramount for me. "Firstly, to offer the team the possibility of improving their sporting performance and secondly, to safeguard the site at Hinwil and the jobs of today's 300-strong workforce. "The partnership with BMW guarantees continuity. I know it will give the workforce a very good outlook." Sauber's decision means the end for another of F1's independent teams - only Williams, Red Bull, Minardi and Jordan are now not either owned or part-owned by a major motor manufacturer. BMW said it had not been put off by the political rows rocking F1. Seven teams and five car manufacturers - including BMW - have threatened to set up a rival championship in 2008 if they are not given more say in the running of the sport and a greater share of its revenues. "We anticipate that Formula One will emerge strengthened from the current restructuring phase and that it will continue to represent the top echelon of motorsport for the future," said Goeschel. Sauber began life in F1 in 1993 with backing from BMW's bitter German rivals Mercedes. But Mercedes backed out of the Sauber link up in 1995 to join forces with McLaren, leaving Ford to take over as engine supplier.